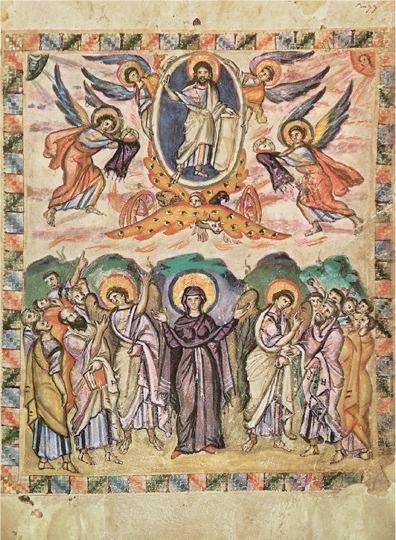 Ascension, Rabbula Gospels, 6th c.
Love’s redeeming work is done by Charles Wesley is a cento composed of stanxas ii.-v.,x., of his hymn “Christ the Lord is risen to-day.” Books originating in the Church of England tradition use the tune SAVANNAH, first found in England in John Wesley’s A Collection of Tunes, Set to Music, as they are commonly sung at the Foundery (1742), with the name HERNHUTH, which indicates its origins in 18th-century Moravian books. The name SAVANNAH comes from the Moravian settlement at Savannah, Georgia. Wesley accompanied the Moravians on their voyage from England to Savannah and was deeply impressed by their calm and faith during a storm that panicked the sailors. 5 Hail the Lord of earth and heaven! Here is the St Edmundsbury Cathedral Choir. Here is a 1970 version from Guilford Cathedral. Let all mortal flesh keep silence is a paraphrase by James Moultrie (1829—1885) of the Cherubic Hymn from the Liturgy of St. James of the Eastern Church. The hymn dates to the third century. It is chanted as the bread and wine are carried to the altar. The Greek text reads: “Let all mortal flesh keep silent, and stand with fear and trembling, and in itself consider nothing of earth; for the King of kings and Lord of lords cometh forth to be sacrificed, and given as food to the believers; and there go before Him the choirs of Angels, with every dominion and power, the many-eyed Cherubim and the six-winged Seraphim, covering their faces, and crying out the hymn: Alleluia, Alleluia, Alleluia.” Here is the hymn in the 4th Plagal. Here is the Great Entrance. Her is the King’s College, Cambridge, choir. 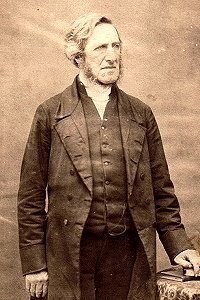 Gerald Moultrie was a Victorian public schoolmaster and Anglican hymnographer born on September 16, 1829, at Rugby Rectory, Warwickshire, England. He died on April 25, 1885, Southleigh, England. PICARDY is a hymn tune, based on a French carol; it is in a minor key and its meter is 8.7.8.7.8.7. Its name comes from the province of France from where it is thought to originate. The tune dates back at least to the 17th century, and was originally used for the folk song “Jésus-Christ s’habille en pauvre”. First published in the 1848 collection Chansons populaires des provinces de France, “Picardy” was most famously arranged by Ralph Vaughan Williams in 1906 for the hymn Let All Mortal Flesh Keep Silence. Kelly employs the poetic device of hypotyposis – a vivid description of a scene or events in words – that provides the singer with a glimpse of the splendor of heaven, which is contrasted with the suffering of the cross and the suffering of all who follow Christ on earth. their joy, the joy of heaven. Here is the Choir of the King’s School. Mr. Kelly was a man of great and varied learning, skilled in the Oriental tongues, and an excellent Bible critic. He was possessed also of musical talent, and composed and published a work that was received with favour, consisting of music adapted to every form of metre in his hymn-book. Naturally of an amiable disposition and thorough in his Christian piety, Mr. Kelly became the friend of good men, and the advocate of every worthy, benevolent, and religious cause. He was admired alike for his zeal and his humility; and his liberality found ample scope in Ireland, especially during the year of famine. The tune ST MAGNUS first appeared in Henry Playford’s Divine Companion(1707 ed.) as an anonymous tune with soprano and bass parts. The tune was later credited to Jeremiah Clark (b. London, England, c. 1670; d. London, 1707), who was a chorister in the Chapel Royal and sang at the coronation of James II in 1685. 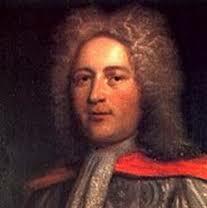 Later he served as organist in Winchester College, St. Paul’s Cathedral, and the Chapel Royal. He shot himself to death in a fit of depression, apparently because of an unhappy romance. Supported by Queen Anne, Clark was a prominent composer in his day, writing songs for the stage as well as anthems, psalm tunes, and harpsichord works. Although ST. MAGNUS was originally used as a setting for Psalm 117, it has been associated with this text since they were combined in the 1868 Appendix to Hymns Ancient and Modern. The tune is named for the Church of St. Magnus the Martyr, built by Christopher Wren in 1676 on Lower Thames Street near the old London Bridge, England. ST. MAGNUS consists of two long lines, each of which has its own sense of climax. The octave leap in the final phrase has a stunning effect, like a vault in a Gothic cathedral. Non vos relinquam orphanos. Alleluia. Vado, et venio ad vos. Alleluia. Et gaudebit, cor vestrum. Alleluia. I will not leave you comfortless. Alleluia. I go, and I will come to you. Alleluia. And your heart shall rejoice. Alleluia. Here are the Cambridge Singers. O Rex gloriae, Domine virtutum, qui triumphator hodie super omnes coelos ascendisti; ne derelinquas nos orphanos, sed mitte promissum Patris in nos, spiritum veritatis. Alleluia. O King of glory, Lord of all power, who ascended to heaven on this day triumphant over all; do not leave us as orphans, but send us the Father’s promise, the spirit of truth. Alleluia. Here are the New Cambridge Singers.